Is the entertainment titan’s struggling stock or the toy giant’s soaring stock a better long-term investment? 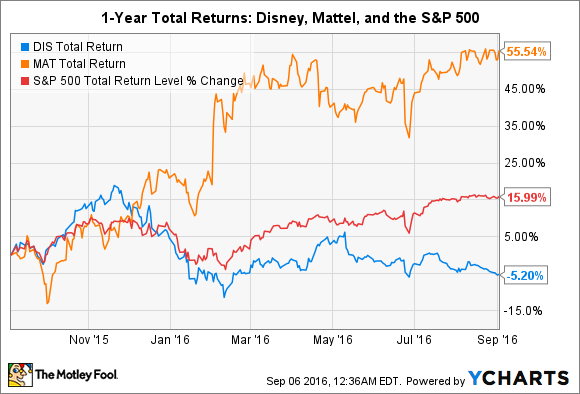 Entertainment giant Walt Disney Co. (NYSE:DIS) and leading toy maker Mattel Inc. (NASDAQ:MAT) aren't direct competitors, but they're both involved in the consumer discretionary market. Moreover, the two have business ties that wax and wane over time, as Mattel is awarded or loses licenses from Disney to produce action figures, dolls, and various other toys based on the Mouse's movies and other intellectual property. The stocks of the two companies have moved in opposite directions over the last year, as the chart above shows. Disney's stock has lost ground thanks to concerns about cord-cutting putting enough of a dent in its lucrative cable networks business to negatively affect the company's overall profitability. Mattel's stock has soared largely due to a rebound in Barbie sales and other signs suggesting its turnaround is on track, as well as news revealed earlier in the year that it and rival Hasbro had been in merger talks a while back. Is Disney's stock a better buy after the sell-off or does Mattel's stock make the better long-term bet even after its big run-up? Data source: YCharts. Market capitalization = stock price x number of shares outstanding. YOY = year over year; TTM = trailing 12 months. Data to Sept. 2. What might jump out at you in the above table is that Disney's revenue and earnings growth over the last year have been very solid, whereas Mattel's revenue and earnings have shrunk. Three of Disney's four business units -- parks and resorts, studio entertainment, and consumer products/interactive media -- have been firing on all cylinders. Its largest segment, media networks, which is comprised of its cable and TV networks, has been holding its own with low-single-digit revenue and earnings growth in fiscal 2016. Despite Disney's better growth dynamics, its stock is more attractively valued from both a trailing and a forward P/E basis. Moreover, Disney's stock is also more attractively valued from both a cash flow from operations and free cash flow basis; its P/CFO and P/FCF are 12.3 and 20, respectively, whereas Mattel's are 15.6 and 23.7. A case can be made from these numbers that Disney's stock looks like a better buy than Mattel's. Disney's robust 5- and 10-year returns bolster this argument. While past returns aren't indicative of future returns, strong longer-term returns suggest that a company has a sustainable competitive advantage its top management team has been able to successfully exploit. Of course, the market is a forward-looking machine, and what the market is saying from these numbers is that investors and short-term traders collectively are betting that Mattel's longer-term growth prospects are more attractive than Disney's. Mattel is a considerably smaller company than Disney, with a market cap of $1.5 billion -- just one-tenth the size of Disney's. All other things being equal, it's easier for smaller companies to grow revenue and earnings on a percentage basis than it is for larger companies because they're starting with a smaller base number. So, Mattel's smaller size relative to Disney is one reason some investors might believe it has a better chance of growing earnings -- and, hence, its stock price -- faster over the long term. Rebounding Barbie sales are another factor that could bolster the argument for Mattel's stock. In the second quarter, sales of the iconic fashion doll, which have declined for several years, jumped 23% year over year as reported, and 24% in constant currency. That said, one consecutive quarter (sales declined the previous quarter) doesn't make a comeback, so investors shouldn't get ahead of themselves declaring that "Barbie is back." Income investors are a group that might favor Mattel's stock because its dividend is yielding a fat 4.5%, dwarfing Disney's 1.5% yield. The counterargument here is that there's much room for growth in Disney's dividend, whereas Mattel's dividend is not sustainable over the long term unless the company's cash flow situation improves. Mattel's payout ratio based on net income (dividends paid/net income) is a very high 149%. Its cash dividend ratio payout (dividends paid/free cash flow) is 107%, which means it paid out slightly more in dividends over the trailing 12 months than it generated in free cash flow. So, Mattel is either eating into its cash hoard or borrowing more money to make up the difference. Choosing between these two stocks comes down to betting that one of these scenarios looks more probable: that Disney will be able to overcome cord-cutting challenges in its cable networks business and continue to successfully grow its empire, or that Mattel will successfully turn around its business. Of course, this doesn't have to be an either-or situation; both companies could thrive going forward. Personally, I have full confidence that Disney will be able to successfully navigate the changing consumer media market -- it's done so many times since its founding in 1923 -- and also continue to grow its other diverse businesses. The company's intellectual property is second to none -- and if you believe "content is king," you should bet on Disney. However, it's not unreasonable for some investors to favor Mattel. CEO Chris Sinclair is doing a great job at this point in the turnaround. That said, the stock's valuation is already pricing in strong future growth. So, it seems to me that the easy money has been made on this stock, and the fundamentals are going to take a while to catch up to the stock price.